Hello everyone! 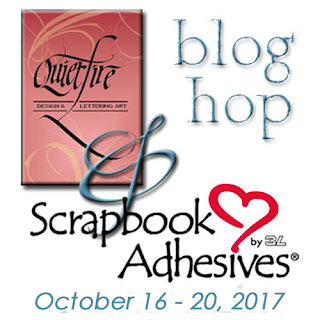 Welcome to Day 1 of the Quietfire - Scrapbook Adhesives by 3L® Blog Hop and Giveaway! We're so lucky to be playing along this week with Scrapbook Adhesives by 3L®! We're going to have lots of inspiration from two whole design teams and the goodness will continue all week. Make sure you enter to win the prizes - read on to the end of the post for details! We'll start with our Yogi who is the Queen of Easel Cards. The great thing about easel cards is you can see the inside and outside of the card at the same time. Scored, folded my deep blue cardstock to create the easel. Cut another piece same size as card and adhered to front using the EZ Runner Permanent Adhesive. I raided my stash of Oxide backgrounds I made a while back... Trimmed down and adhered to front offset. 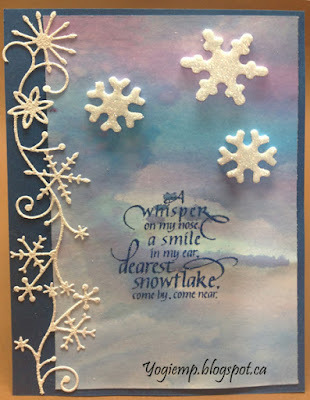 Die cut some snowflake borders (Memory Box "Frosty Border") from white cardstock. 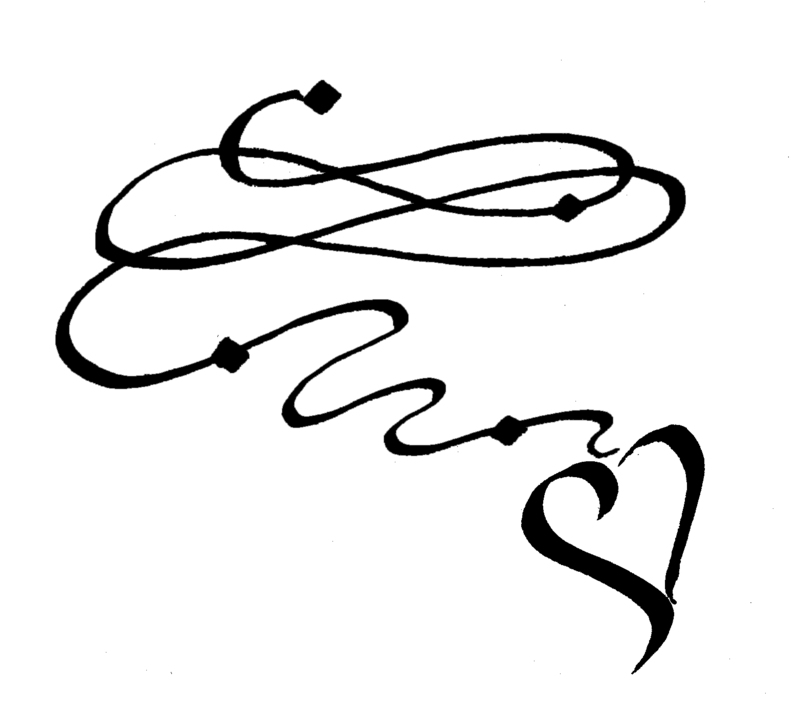 Inked with Versamark and embossed with Emerald Creek "Soft Fallen Snow". Pieced 2 together and adhered to left edge. Adhered three adhesive backed foam snowflakes (Scrapbook Adhesives by 3L "3D Foam Holiday Embellishment Kit"). Removed the release liner from the front and sprinkled with Stickles dry glitter "Diamond". 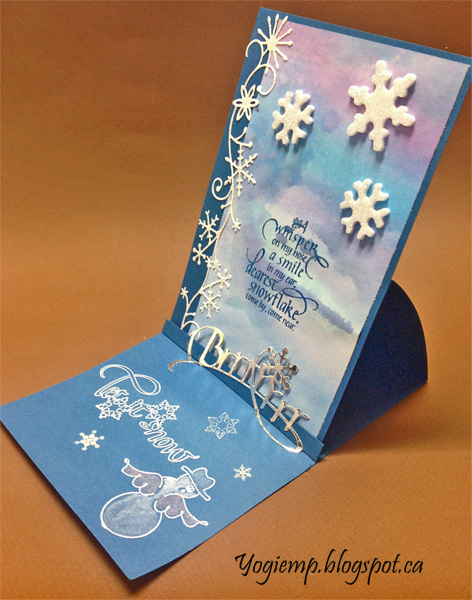 Stamped the quote using Versafine "Majestic Blue" and embossing with Emerald Creek "Blue Sparkle" embossing powder. On the floor: stamped the various items using Distress Picket Fence and embossing with white embossing powder. 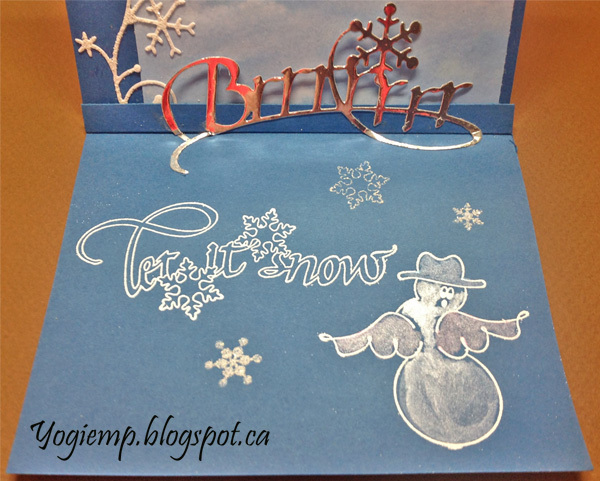 Die cut the "Brrr" from DoCrafts Silver mirror cardstock. Cut, scored and adhered the die cut word and then adhered it to the floor to act as my stopper. Scrapbook Adhesives "3D Foam Holiday Embellishment Kit"
It seems Monday is blue day! 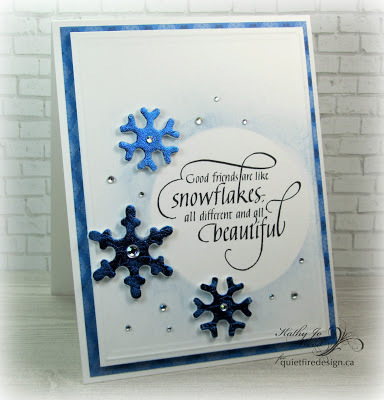 Kathy Jo has also used winter blues and snowflakes for her project. With Christmas quickly approaching, I decided to create a shimmery snowflake card. 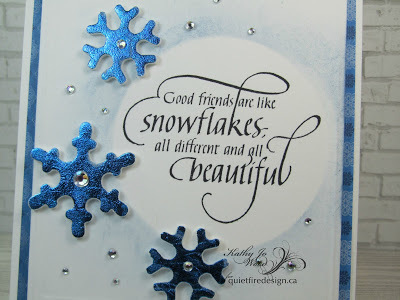 The card's gorgeous and sweet sentiment is QuietfireDesign's Good Friends are Like Snowflakes stamp. It was stamped on white card stock and cut to size. A circle die cut was placed on top of the sentiment and blue ink applied. It was mounted using 3D FoamSquares onto the card front. Next, the happy snowflakes from the 3D FoamHoliday Embellishments Kit were applied. The blue foil from the same kit was adhered to the top (how easy!) and gems added. The card came together in a flash and was too fun to make. 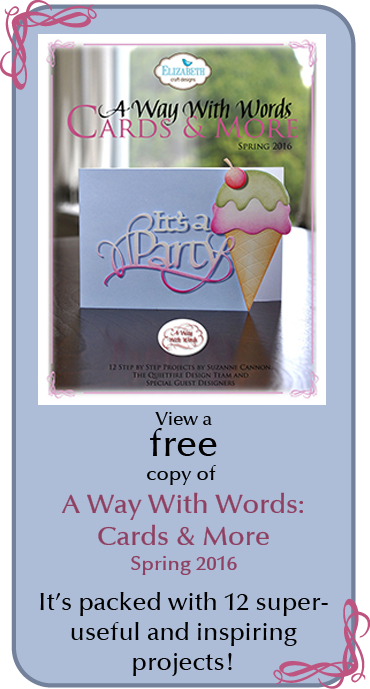 Also, the card is perfect to give away at Christmas and the recipient can keep it on display well into the new year. We're giving away three prizes valued at $25 each. Make sure you enter to win by filling out the Rafflecopter thingy below! 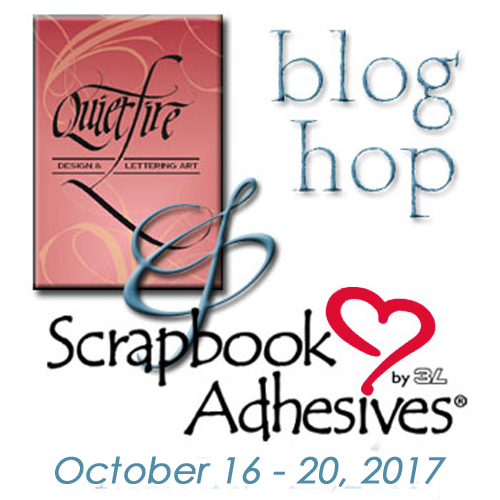 Then hop over to our Scrapbook Adhesives by 3L® creative colleagues by clicking HERE to enter their giveaway! Good luck! Very pretty snowflake cards. I like the shades of blue color and the sparkle. you a feeling of cold and winter. Love to make easel cards. Oh my goodness!!! Both these cards are super super cute!!! Great Christmas cards ideas. I love the mix of sentiment stamp and embellishments. I will use that technique in the future. a fun week of hopping! very nice cards Thank yo for sharing! Oh I am loving this! Thanks for sharing! Beautiful cards ... thanks for the opportunity! Your cards are gorgeous! The colors are beautiful! Thanks for the inspiration and for the opportunity to win! Love all the foiled shine on your cards. Perfect for a chilly winter season! Beautiful cards!! I love how the 3D snowflakes can be used with both glitter and foil! 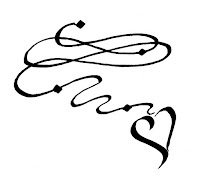 Love the simplicity yet elegant design! What great cards. I love the snowflakes! Thanks for the chance to win. The cards are so wonderful. I love winter and the snowflakes look so real. Ihope i win! I love the blue cards! I am not a Christmas or winter traditional color gal! Love these! Thanks for the inspiration! I love the sentiment about snowflakes being different! Beautiful cards! I like doing layered cards! Awesome cards! Really love the sentiments on both cards! I love the snowflakes and your adhesives are the best. Wonderful cards. 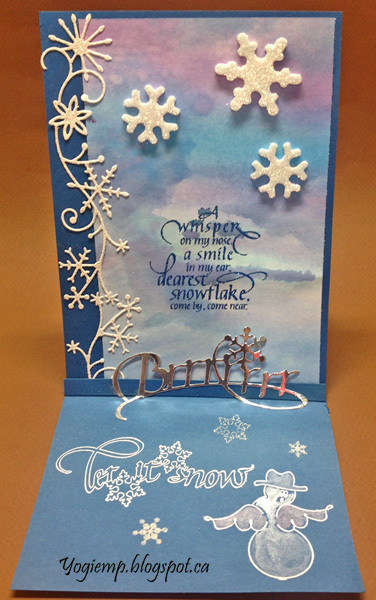 Love sentiments and fun BRRR die cut. 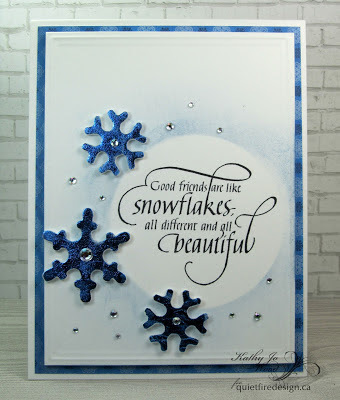 Beautiful snowflakes and lovely snowflake sentiments on these pretty cards! Beautiful cards. Love the snowflake border on the easel card. Both of these are stunning but I especially love Yogi’s Card! TFS! I'm not a snow person but I adore the beauty of snowflakes. Your cards are lovely. All these cards are just soooo gorgeous ! !